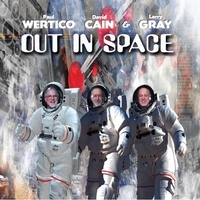 7-time Grammy Award winner Paul Wertico, David Cain, and Larry Gray came together to form Wertico Cain & Gray to realize new music and art, winning a prestigious live performance album award along the way, and gathering audiences in search of new worlds of sound-making and digital cinema. Chicago-based, this spontaneous trio composes and orchestrates everything in real-time, melting acoustic and electronic sounds with new-tech and word-tech, in-sync with an inner muse that connects to the universe of possibilities, and musically conversing to the point of sheer telepathy. Wertico Cain & Gray’s 6th album, AfterLive, is the story of improvisational time capsules: the live concert improvisations and the soul-searching listeners’ mix. A further documentation of this trio’s ongoing fearless commitment to bringing together worlds of styles and inspirations into moments of reality, and creating music for people who love to live an adventure through music and dream through sound. 100% improvised & recorded live at Evanston SPACE, August 11, 2016. AfterLive is available here on iTunes and CD Baby. Our intention was to create short, spontaneous compositions. These 40 tracks form a complete compositional thought. The mixes were realized as living, breathing moments of creative flow and the titles of the tracks vibrate as poetry that tells our story. iTunes and CD Baby. 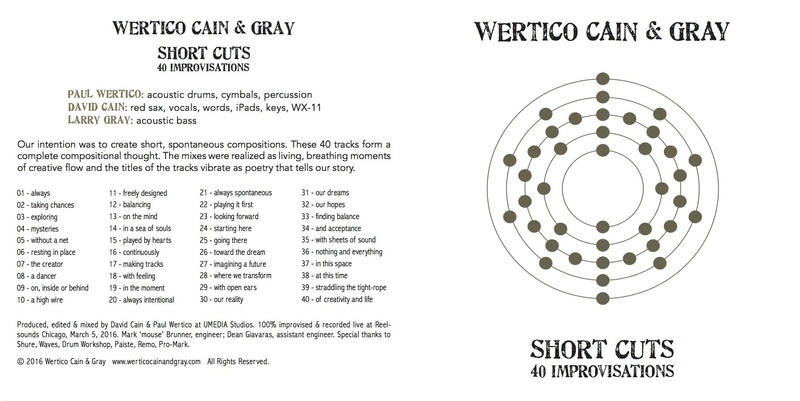 Wertico Cain & Gray’s 5th CD “SHORT CUTS – 40 IMPROVISATIONS” made the First-Round Ballots in Field 10: Category 33 – BEST JAZZ INSTRUMENTAL ALBUM of the 59th Annual GRAMMY Awards. The new Wertico Cain & Gray album, REALIZATION, is available on iTunes and CD Baby. REALIZATION is an album that brings together worlds of styles and inspirations into moments of reality. It’s music for people who love to live an adventure through music, and dream through sound. The Wertico Cain & Gray REALIZATION @ iTunes and as Video-On-Demand includes 2 bonus videos: WCG Conversations (recorded at the Jazz Showcase, Chicago, December 5, 2015) and a behind-the-scenes Filmmaking Commentary. Organic Architecture, by Wertico Cain & Gray, was 100% improvised and recorded live in Frank Lloyd Wright’s famous Dana-Thomas House (Illinois State Historic Site) on February 15, 2014. This video and audio project pioneers a new direction in music and video! Video On-Demand. Wertico, Cain & Gray’s CD “Sound Portraits” won Best Live Performance Album in the 13th Annual Independent Music Awards (2014). Video On-Demand. “Awesome! A total trip! Amazing! Great music!” ~ Frank Alkyer, Publisher, DownBeat. Sound Portraits audio is available as CD or download! Wertico Cain & Gray were featured artists in concert at Shure headquarters in Chicago on March 27, 2015.. Two of the improvs (below) were based on short films shot/edited by David Cain. People, places and things as imagined/experienced as subatomic levels of awareness in multiverse rhythms of shape, color, texture and tempo. David Cain talks about his use of Waves audio plugins for live performance, mixing and mastering. We love Waves plugins! NPR / WUIS Radio Interview: Musicians Create “Sound Portraits” by Rachel Otwell.